Lansing, Mich. — The Michigan Department of Transportation (MDOT) launched an online dashboard to make information about the condition of all bridges on state and local road systems easily accessible to the public. 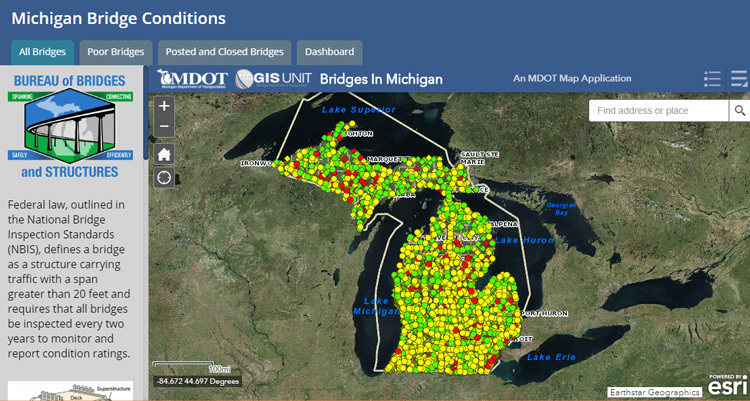 Replacing a more limited version from 2018, the Michigan Bridge Conditions dashboard is now online at https://mdot.maps.arcgis.com/apps/MapSeries/index.html?appid=fb70725b2be04dc7b01703d0b6c91bb6, providing data on more than 11,000 bridges across the state. Bridges on the state (I, M and US routes) and local road systems are rated good, fair or poor. The dashboard shows visual representations of the number of bridges in each category, while an interactive map on the site shows the location and color-coded status for each structure. Users can sort and view data by bridge rating, ownership or geographical area. Zooming in on the map and clicking on an icon for an individual bridge pulls up more detailed information about that structure. The dashboard can also provide comparisons between different bridge categories. Beginning in January, MDOT worked to improve its existing bridge dashboard by including all bridges, not just those on the National Highway System. The new site is also directly connected to a bridge database so that the dashboard reflects the most current available data instead of only being a snapshot in time.